Simple ice packs are an easy choice for icing during the initial treatment process. Remember Rest, Ice, Compression, and Elevation are the keys to injury treatment. There are many different ways to apply ice. Below you will find some of the easiest and most effective ways. The best ice bags are usually made from crushed or flaked ice, placed into a small plastic bag and then tied off at the top. By using a small amount of ice, squeezing out all of the air from the bag, and tying the knot at the very top, you can produce an ice bag that can be flattened out and wrapped around an injury, completely covering the injured area. 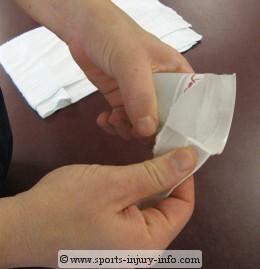 This is the most common way a certified athletic trainer applies ice. It is easy, inexpensive, and effective. 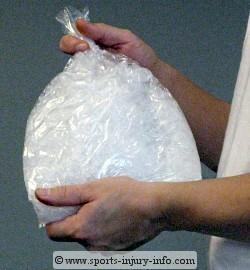 But for "at home" ice bags, finding crushed or flaked ice is sometimes not that easy. Trying to crush your own ice in either a blender or by hand is time consuming. And Ziploc type bags aren't the easiest to use for ice application. Believe it or not, you can buy a very inexpensive, reusable, and effective ice bag at your local grocery store. Frozen peas, (or frozen corn for that matter) make a great ice bag. The vegetable is small, similar to crushed or flaked ice, and is already sealed in a plastic bag. Simply take them out of the freezer, wrap them around that sprained ankle, and leave on for 15-20 minutes. When you are done, put them back and save for next time. Of course, I do not recommend you mix them in with your other frozen goods, as they do not taste very good after the fact. I regularly recommend frozen peas as an effective way of icing to my patients, and they all have seen good results. Effective, inexpensive, and easy. 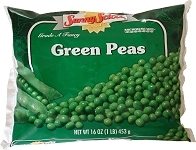 Of course, if you do not have a taste for frozen vegetables, there are many different commercial ice packs available on the market. From the one use "smack packs" to the re-freezable gel packs, they can be found at your local drug store or pharmacy. Not all ice packs are equal. When looking at commercial packs, you should purchase one that is flexible when cold, so that it will mold around your injured body part. This increases the contact between the skin and the ice pack, and allows for greater cooling. If you are purchasing an ice pack, you should also try to find one that is re-useable, as single use packs are more expensive in the long run. Commercial cold packs that provide compression as well as cooling are the best choices for regular use. By providing compression, they aid greatly in the cooling of the tissues, as well as helping to control any swelling. While they are more expensive than frozen peas, I highly recommend these commercial ice packs to my patients, especially those who are dealing with post-surgical rehabilitation, or who have the need to ice on a regular basis. In addition to ice bags, ice massage and cold soaks are another way to ice. Depending on your injury, these may be good alternatives to an ice pack. Ice massage cups can easily be made with small paper Dixie cups (usually the bathroom size) by filling the cups 3/4 full with water and freezing. Once frozen, tear the top half of the cup away, leaving the bottom of the cup as a handle. Rubbing the ice cup on an injured area for about 10 minutes will produce adequate cooling effects. Ice massage is very effective for patellar tendonitis, bursitis, and shin splints. Cold soaks can also be effective for icing an injury. 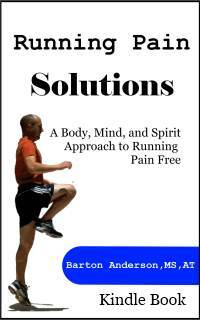 This is most useful for ankle and lower leg injuries, as well as hand and wrist injuries. It is hard to soak a sore shoulder...unless you are willing to submerge your whole body. Preparing an ice soak or cold bath can be done in any type of container sufficient in size to hold enough water to submerge the injured part. Combine ice and water until it reaches temperatures between 55 and 65 degrees F. Submerge for 15-20 minutes. Applying an ice bag, ice massage, or cold bath can produce many sensations in the injured body part. The response of the body varies from person to person, but the most common feelings encountered include tingling, burning, and mild discomfort, followed by a numbness and loss of sensation. This is especially true when ice bags are wrapped on tightly. These sensations are all normal. The burning associated with icing is not damaging the skin, but more an overload stimulation of the nerves. After the first 3-5 minutes, this burning subsides. But in order for a ice to be effective, it should be left on continuously for 15-20 minutes. So grin and bear that burning, it is doing your more good than harm! One word of caution regarding some commercial ice packs. Re-freezable gel packs often contain chemicals that help keep them flexible even when frozen. These chemicals can cause the packs to be colder than freezing (32 degrees F, 0 degrees C) and should NOT be placed directly on the skin. Use a moist cloth or towel between the ice pack and the skin. Ice packs using ice, frozen vegetables, ice massage, or temperature controlled ice soaks will not cause frostbite or frost burn if used appropriately. As the ice pack contacts the skin, it begins to warm up, or melt, and the temperature of the skin never dips below freezing, which is necessary for damage to occur. Ice bags can take on many different forms, from commercial gel packs to frozen vegetables. How you apply ice is not as important as the fact that you DO apply ice. For more on the benefits of ice, read about the RICE Principles for acute injury treatment.